It was Sunday (28/04/2013). After a full day of refreshing activities, a day before, this sunday morning, I was still not fully charged. I really lost my motivation to do my PhD stuff. The refreshing activities by doing different things to kick the boredome, did not really work, apparently. This Sunday morning, I was still slow and mellow. I felt so lonely. I felt I had no body to share with. My heart was trapped in the dark place of nowhere. I felt so homesick. My heart was hankering my lovely ones. I did not want to eat and drink. Usually, On Sunday morning, I wake up early in the morning and go to the lab. But, I did not know what to do this Sunday. Oh God, I did not know what happen with me. Where were my courage and determination? I felt that the courage and determination of mine, that ever fired me up, were stolen by some one. Oh God. Please help me to find it back. Without them I was nothing but a bird without wings. I opened my laptop and I just still did not want to do my Phd Stuffs. I opened my blog and wrote a free writing stuffs while hearing some my old songs that ever nurtured my courage and determination. The old song that ever inspired me to be a highly motivated One. But, again they did not really work. I took my smart phone, and contacted some friends of mine to share about my feeling. They were so surprise, they thought that I was not what I told to them. Really, I did not like this kind of feeling. Perhaps, I have forgotten what my destiny to come here, in the UK. Oh dear my self, what was happening on you darling! I went out from the bedroom to the kitchen. I cooked my own food and had breakfast together with my housemate. It was a rare occasion, we had time to have breakfast together, indeed. After the breakfast, my housemate left the house, I was trapped in my room again. Finally, I decided to do what I had never to do before in this country. 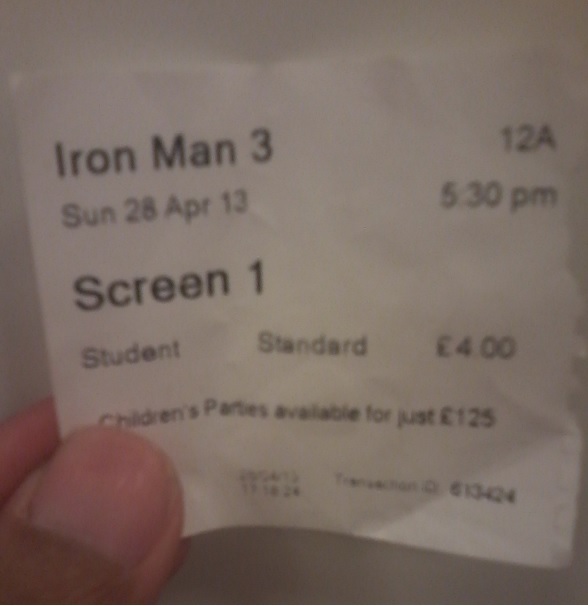 I planned to go to the cinema for Iron Man 3, eventhough I was not a movie goer. Frequently, my collegues invited and persuaded me to go to the cinema, but I always refused their invitation. Today, I invited my friends to go to the cinema. It was really a weird thing indeed. 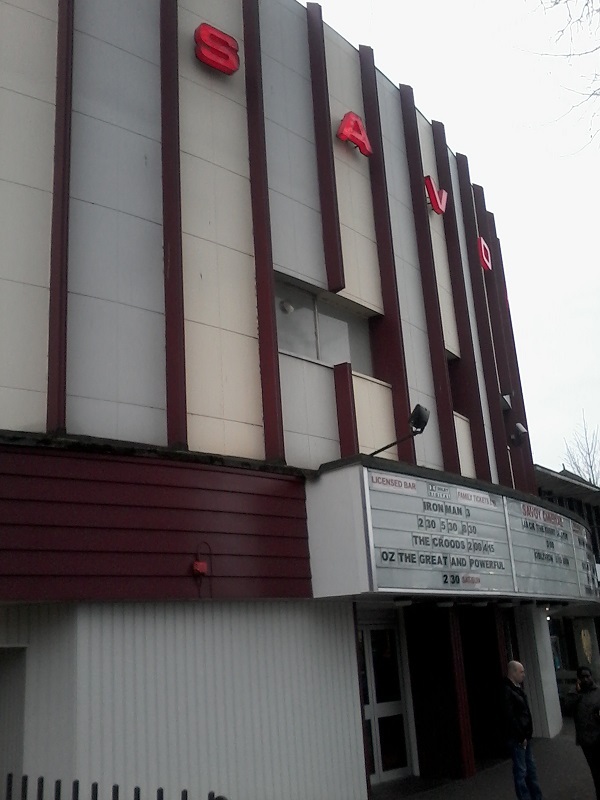 I booked the tickets online from Savoy Cinema and paid with my debit card. It was only £4 per each, for students price. I booked the ticket for the movie starting at 05.30 PM. I went to the cinema with Arif by walking from our house and Met Mas Walid at the cinema who rode a bus. Apparently, it is very close to our house. It is only 10 minutes walking to the place. Eventhough, the movie was scheduled at 05.30 pm. It was just starting at 05.50 pm. The place was not so excellent but still quite convinient . Perhaps, it because it was the low cost cinema. It was our first time to see the movie in the UK, and it was our first time to see moview without subtitile. However, although I was unable to catch each single word, I still understood the main idea of the movie. I did not watch the prior movies, i.e. Iron Man 1, and Iron Man 2. It made me not easy to catch the whole story. Fortunately, the movie was quite entertaining. The futuristic story and the awesome movie affect, made the movie, entertaining to follow. Basically, I am not a movie goer. I remembered many times ago, I went to the cinema, for accompany my friends only. While they were enthusiastically the moview, I was sleeping. Then, when they discuseed the moview after watching, I have no clue what to say. It was a funny thing of me. From the cinema, I went to a mosque nearby the cinema. 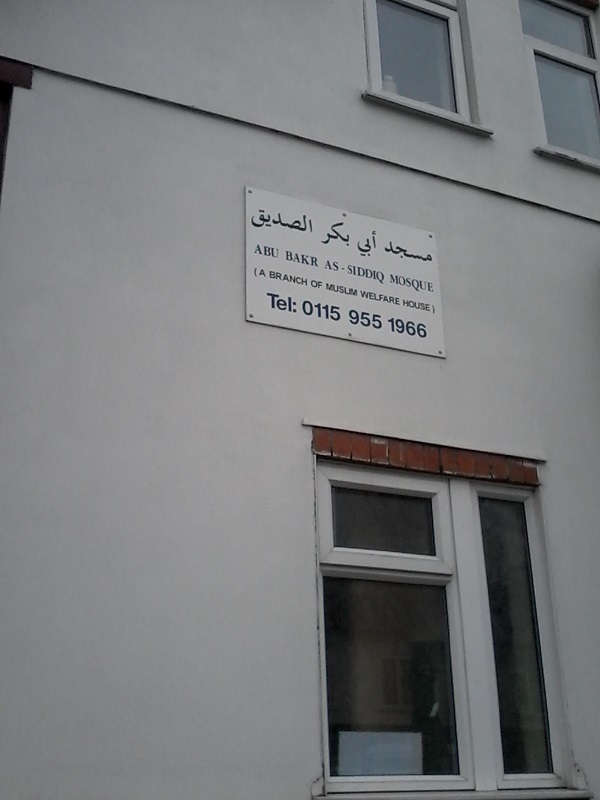 We accidentally found this mosque on our way to the cinema. It was quite small mosque. It was basically a house converted to mosque. Still, it was a convenience place for prayer. We made prayer Ashar and Maghrib in this Mosque. 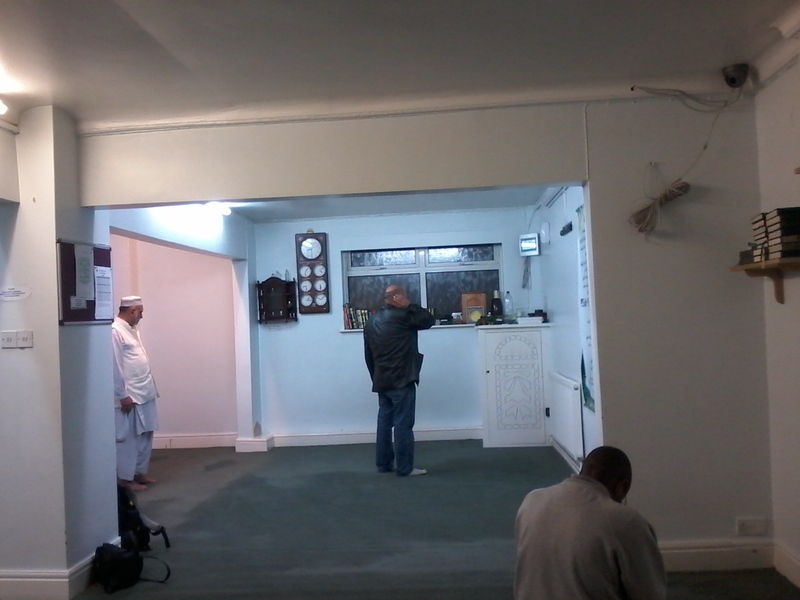 In the mosque, we met some brothers from Pakistan, Algeria, and others. There were always pure happiness to meet other muslims in the country where muslims are minority. There was a funny story, that was when we were making Ashar prayer. Suddenly, there was a brother touched our shoulders and changed our directions. Apparently, we faced the wrong qiblat direction. After finishing the Isyak prayer we went back to home on foot. For the first time, mas Walid finally visited our houses. We had a small chat in Arif house while enjoying fried banana that I made and potatoes crisp. We discussed about the traditional games in our childhood age, that rigth now, they were extintc. We tried to name a bunch of traditional games in our villages during that times such as Bentik, Gobak Sodor, just to name a few. It was so regretful that those kind of games were forgotten and no documentation about those game existed. Again, it will be only a fairy tale in undefined time at a random country. Thus, I and Arif planned to make a documentary film about our childhood game in the past later on in the future. Thank you very much for the nice discussion guys! Eventually, I realised that motivation, inspiration, encouragement, and determination were not something that should be located for. However, they can be created by ourselves. It was so normal to be Up and Down along the Journey. Because, we were human not a machine. If we had set up the mountain of destination to climb. It was tabu to go back, because the way back was blocked. If we had set up the island of determination to sail. It was tabu to change the direction. because the boat had lost the direction of the way back. So, juts keep calm and carry on ! It was fine to stop for a while, provided that it was to prepare a higher leap. about the movie, I also watched it last week though I didn’t enjoy at all. Memang susah menjaga konsisten. Refreshing memang cara yg ampuh, kalo belum mampu mengatasi kebosanan ya musti do sumthin yg berbeda. Btw bukan moview kang, tapi movie haha..